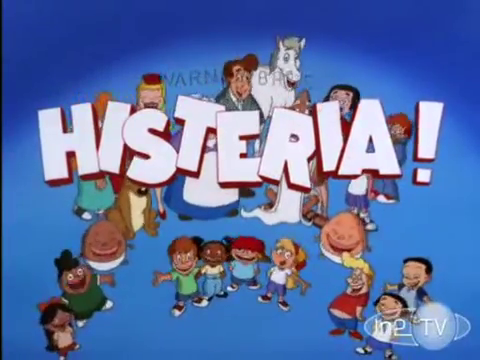 “Histeria!” was created to satisfy the then-new “E/I” educational programming requirement for American TV stations. The E/I rule requires three hours a week of programming that’s educational or informative. The series ran from 1998 to 2001 on Kids’ WB. The historical figures were usually parodies of various celebrities. For instance, Julius Caesar is a parody of Frank Sinatra. Confucius is a parody of the late John McLaughlin, host of PBS’ “The McLaughlin Group” roundtable show. One exception were two segments on Martin Luther King‘s famous “I Have a Dream” speech and Rosa Parks. While Parks’ segment was somewhat comedic, neither historical figure were celebrity parodies. Big Fat Baby, Father Time’s Baby New Year-ish sidekick. His main role (besides displaying the year discussed on his “Baby New Year”-sash) is delivering toilet jokes regarding his diaper. (Yes, it’s a 90s TV cartoon.) Big Fat Baby is sometimes replaced or accompanied by his distaff counterpart, Big Fat Baby Girl, serving the same function. The two also have African-American counterparts. Loud Kiddington, a kid who says all of his dialogue with a very loud voice. Miss Information, a cheerful (if slightly ditzy) blonde woman who often leads tour groups through historical events. Lydia Karaoke, a network censor for Kids’ WB, who often takes issue with some of the episodes’ content. The World’s Oldest Woman, a woman who claims to be the world’s, well, oldest woman. Her theme song and personality is similar to “Animaniacs”‘s Slappy Squirrel. Toast, a young teenager with a “surfer dude” personality/accent. Pepper Mills, a 40s-dressed bobby soxer. Pepper is easily excited about meeting various historical figures, often screaming for them hysterically and wanting their autographs. A running gag is Pepper thinking a historical figure’s a certain celebrity. For instance, she once thought Vladimir Lenin was John Lennon. Cho-Cho, a young girl of Asian descent. For whatever reason, the song “Chopsticks” plays in the background when she has dialogue. Aka Pella: a young African-American girl who has a sassy voice and personality. Some episodes were available online for a time. However, they’ve since vanished from the Internet, save for YouTube uploads. In 2016, the complete series was released to DVD as a box set. Cree Summer voiced Aka Pella.